A former Iraqi investigator said more then $US13 billion of the money allocated for reconstruction projects in Iraq was wasted or stolen, with some of it ending up in al-Qaeda’s coffers. Salam Adhoob, a former chief investigator for Iraq's Commission on Public Integrity – which U.S. officials call Iraq’s equivalent of the FBI – was reporting to the Senate Democratic Policy Committee, an arm of the Democratic caucus. He said many of the projects funded by the U.S. ‘were not needed, and many were never built’ like an electricity project in Nineveh province that an oversight agency found ‘existed only on paper’, reports the Washington Post newspaper. Embezzlement schemes were widely used for arms procurement, according to Adhoob. 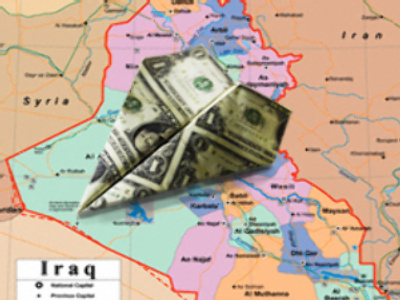 In one case Iraqi Defence ministry officials helped set up two front companies to buy combat vehicles and other equipment with $1.7 billion in U.S. funds. The companies were paid, but for some items only ‘a small percentage’ of the order was delivered and, in one case, the delivered bullet proof vests were defective and absolutely useless. The ex-investigator said the Iraqi government was not interested in investigating such cases and many investigators feared for their lives. Adhoob said 32 of his colleagues have been killed over the three years he worked for the Iraqi agency, and he eventually fled the country himself because of death threats. Adhoob said he reported the situation to the U.S. agency charged with detecting and rooting out cases of waste and abuse – the U.S. Special Inspector General for Iraq Reconstruction. A spokeswoman for the agency commented that it continues to ‘actively follow up’ on the tip but would not discuss ongoing investigations. Speaking along with Adhoob was an Iraqi American who worked as an adviser to Defense and State department officials in Iraq for five years. He testified in silhouette by a video link from an undisclosed location because, he said, he feared for his safety. In a modified voice, he accused Iraqi government officials of working with al-Qaeda members at the Baiji refinery to steal oil to sell on the black market.